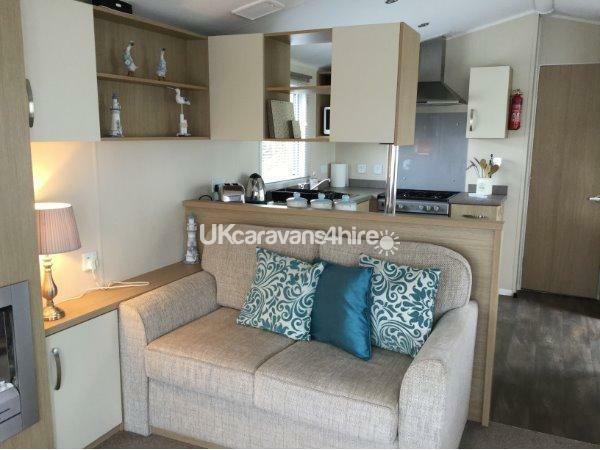 An additional refundable deposit of £100 is required upon booking, which will be returned within 14 days after your holiday once a full inspection has been carried out of our privately owned accommodation. The full balance of your holiday will be required 8 weeks prior to your holiday. Passes are required to access the site amenities and these can be obtained direct from the main Reception. 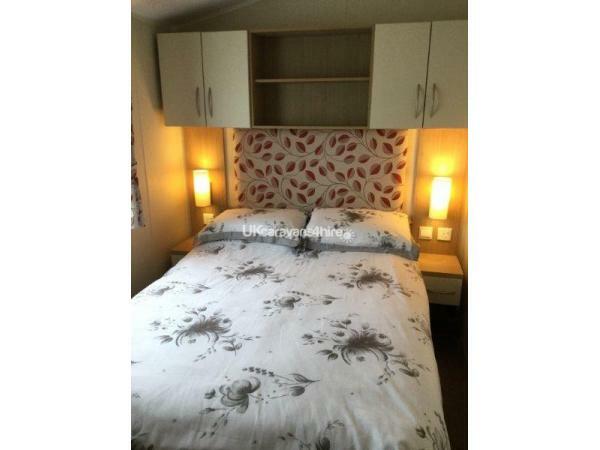 As mentioned previously, duvets and pillows are supplied however you will need to supply your own bed linen, towels, tea towels etc. You will also need to supply your own condiments. Gas and electricity are included in the cost of your holiday. 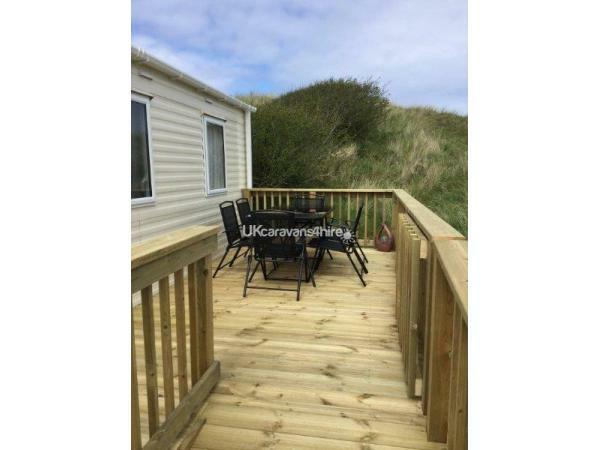 Our caravan is beautifully situated, nestling nicely in a quiet cul-de-sac on the outskirts of the Perran Sands, (Pirran Point district of the Park) with the sand dunes behind and the grassy dunes in front, its a recipe for a relaxing break. With only a caravan on either side of you, you are not overlooked on all sides. There is a little grassed island area with rockery in the centre of the cul-de-sac. 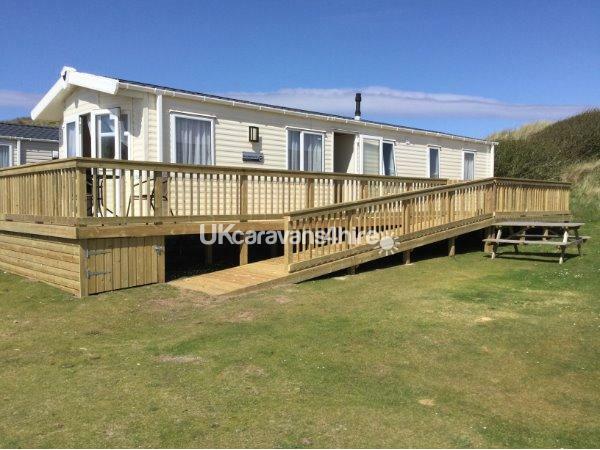 The caravan has full decking around with access via a ramp. 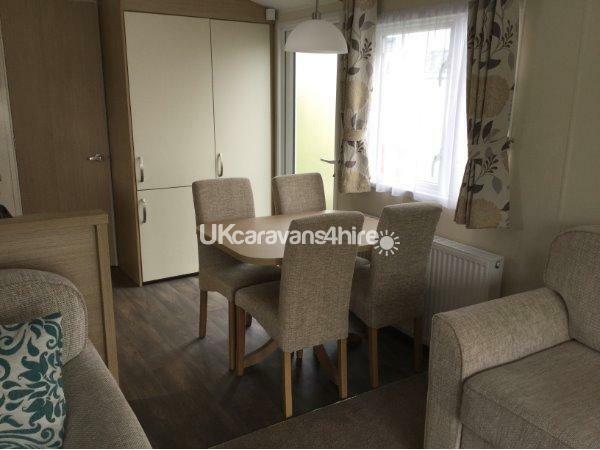 Table and chairs situated on the patio area of the decking, along with a BBQ and picnic table on the grassed area next to our caravan for those lovely summer evening BBQs, solely for your use. 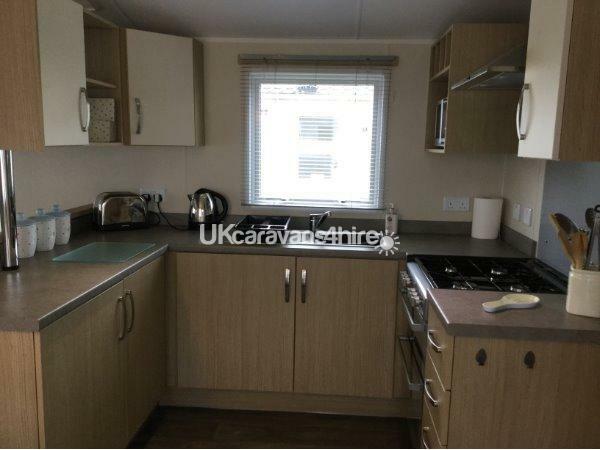 There is ample parking next to the caravan as well. 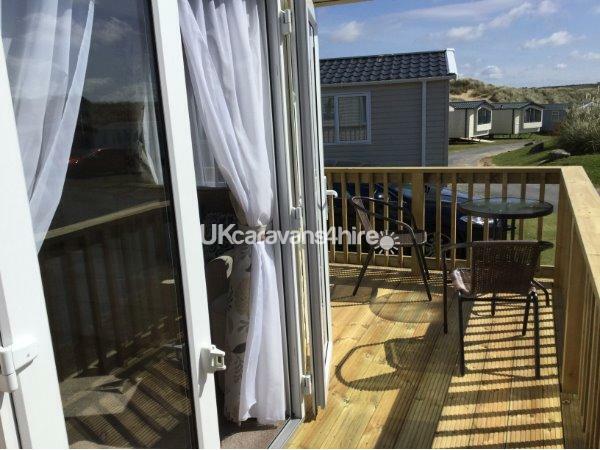 Surrounded by the beautiful sand dunes of Perran Sands our privately owned accommodation is ideally situated for those who wish to have a peaceful break, however, for a short walk of approximately 10 minutes you can be in the hub of all that Perran Sands Holiday Park has to offer. 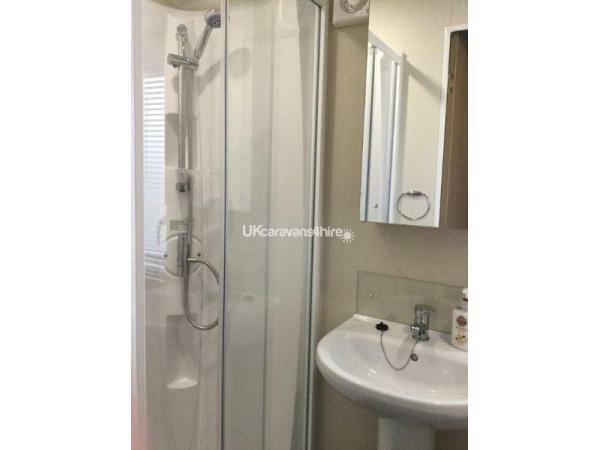 Your nearest towns are Truro, Newquay and St Austell. But would also suggest a visit to any of the following lovely fishing villages, Mevagissey, Padstow and Polperro which have lots of places to eat and drink and of course those wonderful and different little shops and of course there is Perranporth which is just around the corner. 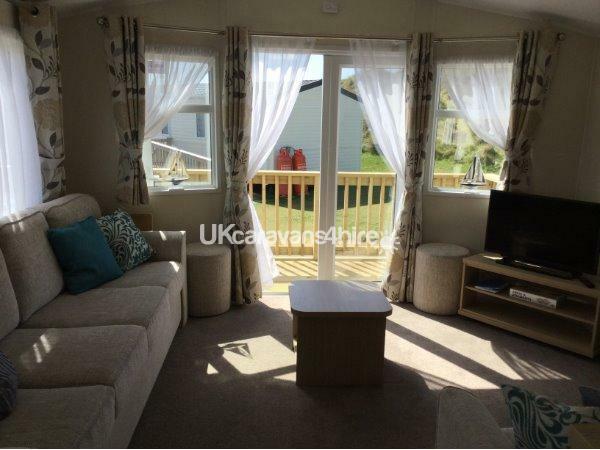 Being located at Perran Sands Holiday Park you are ideally located to visit many of the beautiful places that Cornwall has to offer, a few of our favourites are Tintagel Castle, The Cornish Seal Sanctuary, The Cornish Birds of Prey Centre, Healeys Cornish Cyder Farm. 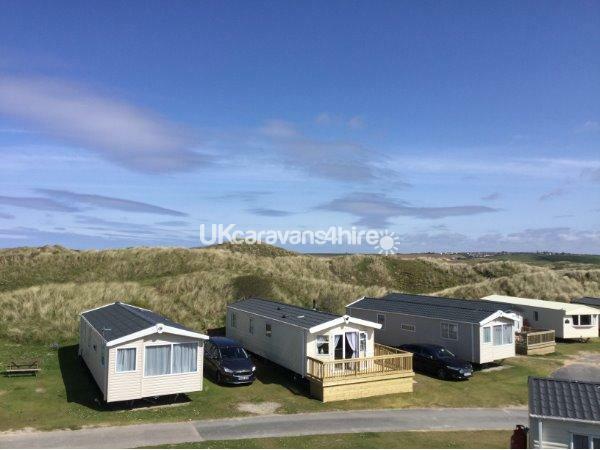 Holywell Bay is another lovely beach to visit if you fancy a short drive and has a nice pub located on the edge called St Pirans Inn and just up the road is Holywell Bay Fun Park and next to that is the Holywell Bay Golf Club which has an 18 hole pitch and putt and an 18 hole golf course. 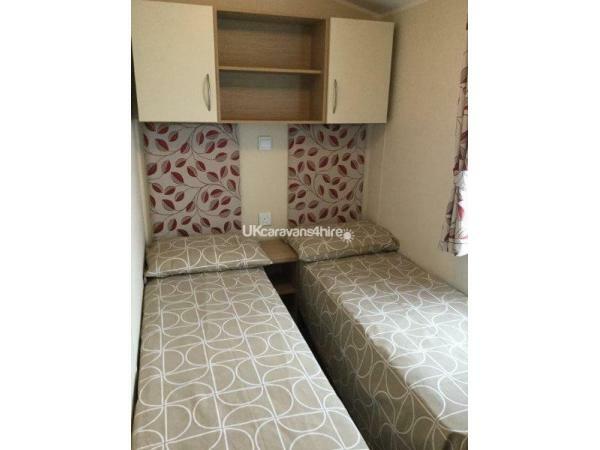 Additional Info: The site offers day and evening entertainment for children and adults, indoor and outdoor swimming pool with flume, crazy golf, activity hub and gym, funworks amusement arcade, indoor play area, go kart hire, multi sports court, play areas, 3 restaurants (including Papa Johns who will deliver to the caravan on request), 3 bars, one with Sky Sports TV, supermarket and a launderette.For those that enjoy walking or even just a nice evening stroll, our privately owned accommodation is beautifully situated in a secluded spot surrounded by the dunes. 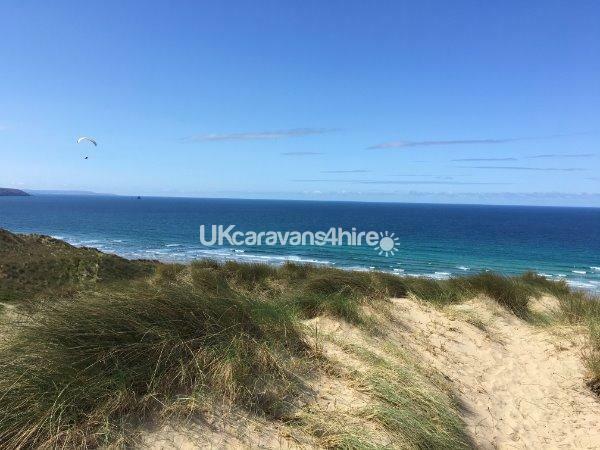 To the front of the caravan you can head inland towards the dunes and walk for miles without meeting a sole, if you head out the back you can walk through the sand dunes towards the beautiful beaches of Perran Sands and Perranporth, either along the beach itself or along the costal path.